I was prepared for some transition time from leaving my sunny, backyard beach in LA for city strewn Paris, but I've since learned that there are some things you simply can't prepare for. I arrived back to a cool, grey, overcast Paris, which was actually an improvement from the cool, grey, rainy Paris I left in June. While I was gone, my place was rented out to someone I didn't know, but to whom I was told was trustworthy with a bonus green thumb to keep my plants thriving. I was anxious to see how my colorful flowers and bountiful herbs were doing, and well, suffice it to say, that they will now be best used as kindling for the fire I will inevitably need to stay warm this summer. The rest of my place went the same way with a furniture rearrangement that I didn't think was possible, on top of a layer of dirt, and a peculiar smell that upon further research was a combination of mold from the flood that occurred in my living room, and the food that was left out for a week. There's no better way to get over jet lag after a 12 hour flight than jumping into some hands and knees floor to ceiling scrubbing. Bienvenue à moi! After cleaning, unpacking and sleeping for 2 days, not necessarily in that order, I was in desperate need of some fresh air. I'd heard much talk of the annual, "Paris Plages," where the beach literally comes to the city. 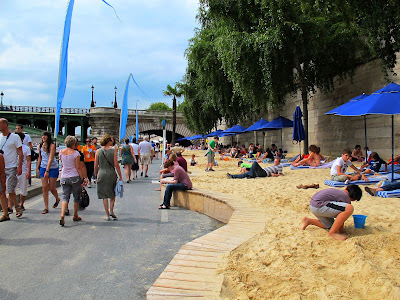 Over 4,000 tons of sand is brought in by 2 large barges to sit on the banks of the Seine for 4 weeks, after which I can only imagine the world's largest dust buster comes in and scoops it all out again. I was ready for some beach time...Parisian style. A day at the beach in Paris, hmmmm, what to wear? It's a beach with sand and lounge chairs, so I went with a bathing suit covered by shorts and a tank top, flip flops, and a straw hat. None of these items have I ever worn outside in Paris, so I walked out my door with some trepidation. It was the longest walk of my life as I saw no one with any of these items on. I'm used to seeing half naked people strolling around the LA beaches with bikinis and bare chests carrying chairs, towels, and enormous bags of games and food under their arms. 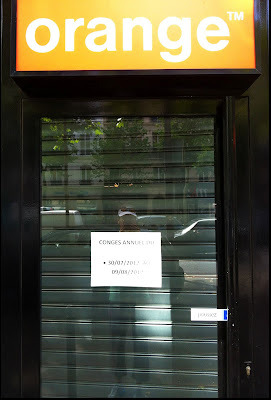 Here, it was the usual Parisian chic without a flip flop in site. As soon as I reached the sand, it started to rain, and the water wasn't from the drops of my tears. People were wearing jeans. Jeans? I did see some shorts (though those were mostly worn by tourists), but most of the ladies were in cute little summer dresses. They seriously can't even take a day off from their fabulousness. 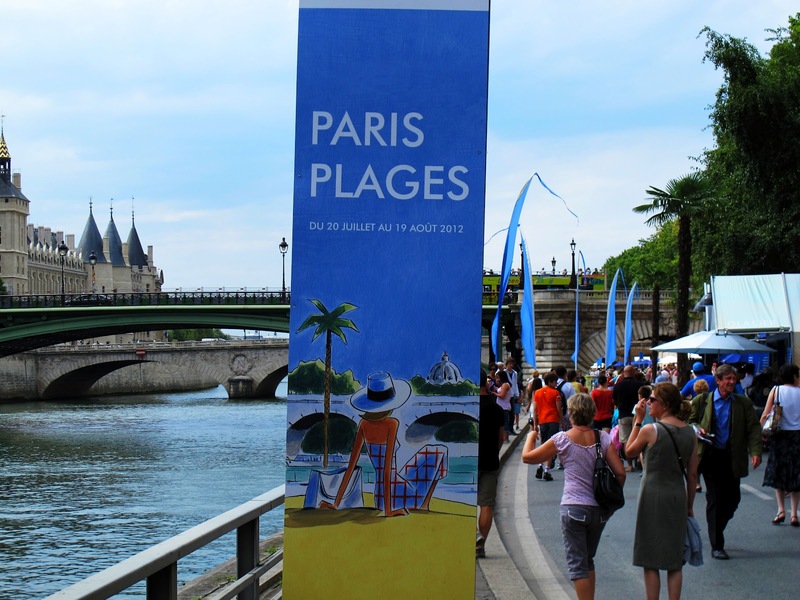 I walked the "strand" that went from below the Hotel de Ville to the Tuilieries. I didn't see one open chair, lounger or otherwise to sit on, but I did see a plethora of palm trees - 44 to be exact. 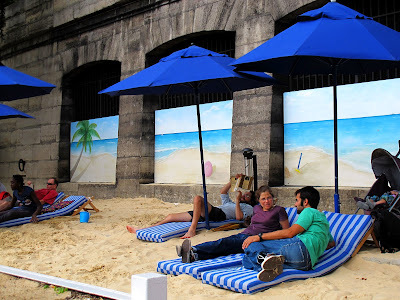 Those are a temporary fixture as well, and I assume will get vacuumed up with the sand. There were games, which in France means petanque and....foosball. Nothing says summer to me like foosball by the beach. And of course you need booze and ice cream, though not necessarily together, but then again, I wouldn't rule it out. Some nights you can hang on the beach until midnight with live music and dancing, but on my day, I was just looking forward to some relaxation and jet leg recovery time. 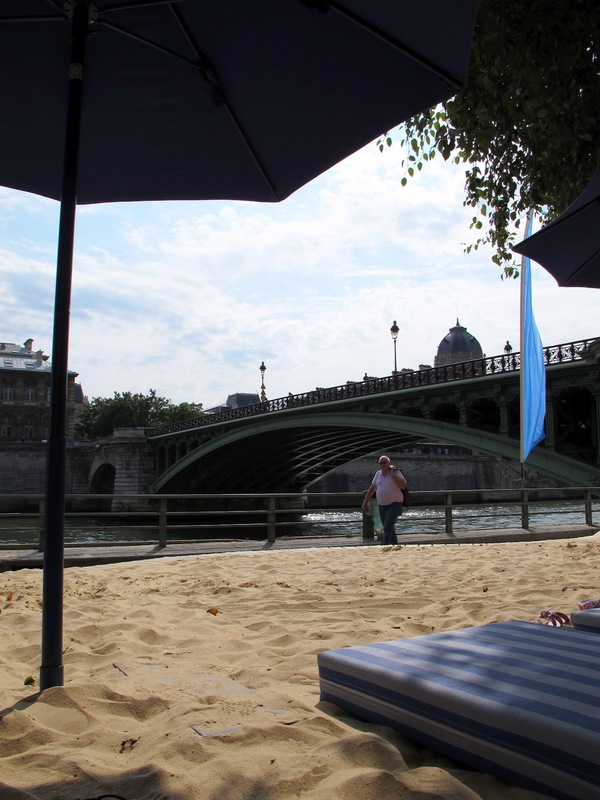 After I walked the length of the beach and back, I found a lone mattress and snagged it and really started to enjoy the magic of Paris Plages. I never expected to be in Paris sitting on the beach in a bathing suit, albeit regrettably, with a view of the sand, water and hundreds of years' old bridges and buildings as the backdrop.Paris continue to surprise and delight me. 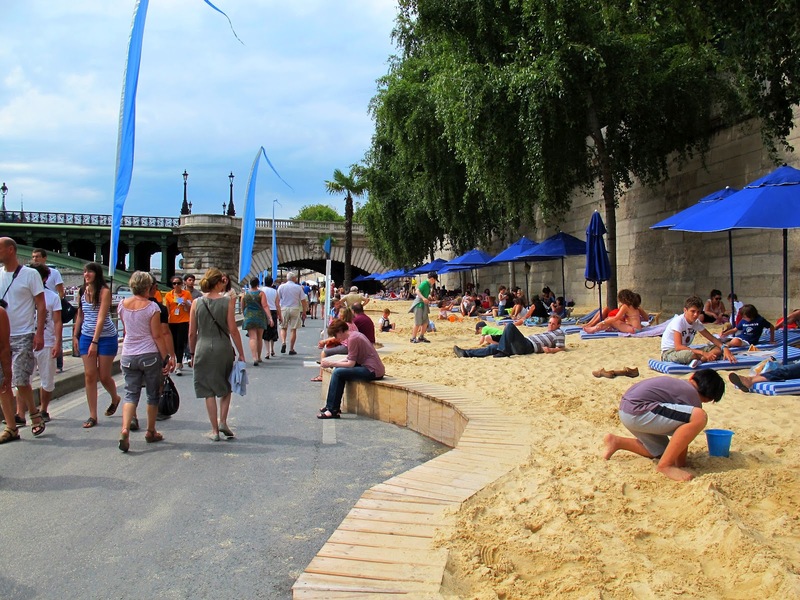 Paris Plages was created as way to entertain the city dwellers who aren't as fortunate as others to take their 4 week summer vacances in their South of France home. 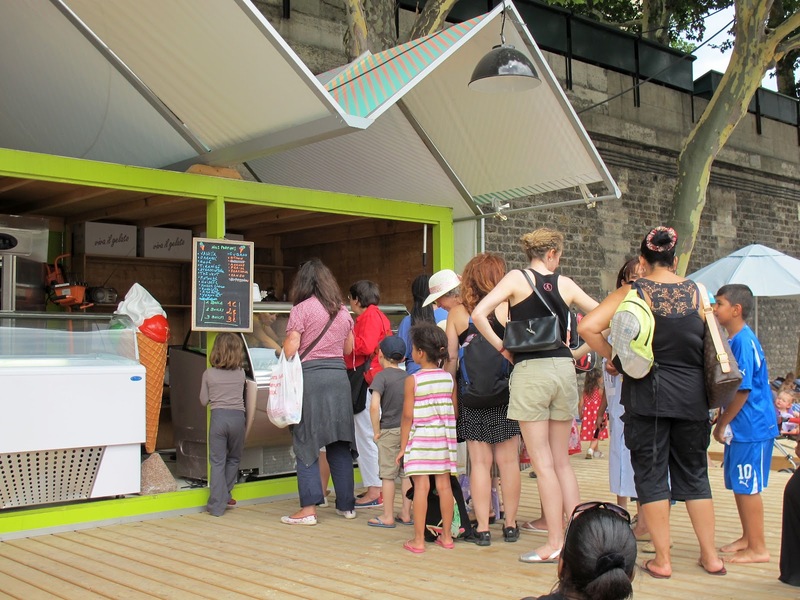 To that end, Paris is nearly deserted by locals in the month of August, but their place is filled with tourists. 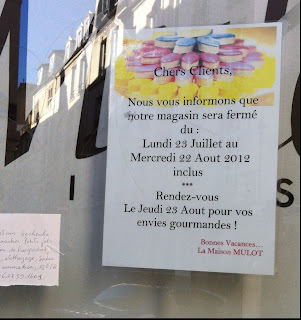 Unfortunately for unknowing tourists, a good portion of the notable restaurants are closed during this time. The closures range from 2-4 weeks and go at seemingly random times from the end of July until the middle/end of August. Paper signs are taped to many a door front around town. I had prepared myself for some restaurant closures, but I was surprised to see large businesses like my local mobile phone provider closed, as well as the fish counter of my grocery store. The store isn't closed, but just the fresh seafood counter at the back where the mysterious Morton's fish guy would stand in his rubber boots. I guess it would be too obvious to say that he's gone fishin. Many of my friends in town love this time of year because it's more quiet, assuming you stay away from major tourists attractions, and the city is just a wee bit friendlier. I'm interested to experience it for myself this month, as well as much, much more to come! PAGE IN PARIS UPDATE: I'm graduating from beginner blogger to at least grade school level now with a real logo (thanks Dean!) and tagline (thanks Sue!). 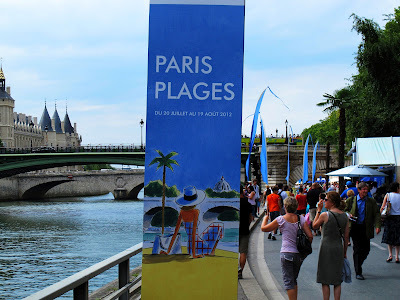 As if that's not enough to get excited about, my blog can now be found directly at pageinparis.com (thanks godaddy). I have my own dot com now, so please update any bookmarks you have or resubscribe to receive each post in your mailbox, and thanks for traveling, tasting and toasting with me!